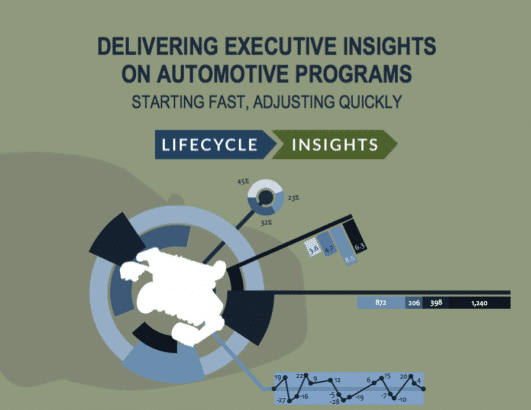 This eBook looks at the challenges of gaining insight into complex product development automotive programs for executives as well as the technologies that offer solutions. This eBook is of most value to executives responsible for the on-time and on-budget delivery of automotive product development programs. For anyone working in product development, that has become an all too familiar demand from executives in any industry. They want reports. They want visibility into the current state of programs. They want key metrics formulated to measure progress and support decision-making. While those efforts can be burdensome at times, the demand is certainly warranted. Today’s technologies, processes and supply chains are overwhelmingly complicated and generate massive amounts of diverse data. As a result, executives are turning more towards metrics as a means to measure progress and root out operational barriers undermining success. They want an up-close look at the specific stages of the process, and they want it in real time. Yet, they also want a birds- eye view into the overall current state of the development. In the highly-competitive automotive industry with increasing demand for localization and diversity, agility can mean the difference between success and failure. With shrinking time-to- market in an expanding global environment, the more pertinent the information executives have at their fingertips, the better they are able to understand and respond to business change.